In this lesson we're going to learn about music intervals. A music interval is the distance between two notes. We divide the music intervals to two groups. The first one is the melodic interval group and the second is the harmonic interval group. When are we Going to Use the Different Intervals? A melodic musical interval is being created when you play two notes one after the other successively. A harmonic interval is being created when the notes are being played in the same time (simultaneously). We use the music intervals for a few important issues in music. The first one is to acknowledge them so that when we hear a melody we could tell between its different melodic intervals and improve our ability to play melodies by ear. More than that we could then build the different scales which are built upon sequences of intervals and then understand the basics of harmony or logic in a melodic line. 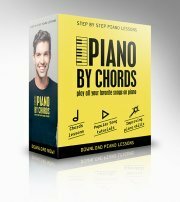 Furthermore we could build the different piano chords when we put two or three (or more) musical intervals one upon the other. Last but not least we'll learn about the relationship between the music intervals since some are dissonant (creating tension) leading to more consonant ones. In music we measure the music intervals according to the number of half tones between two notes. Now if you look at the piano you'll realize that the distance between a white key and a black key would be half a tone except in two places. Music intervals come in various sizes: Unisons, Seconds, Thirds, Fourths, Fifths, Sixths, Sevenths and Eights (Octaves). When we measure a music interval we will always start with the lower note of the interval going to the higher note. We'll count the lower note as one. 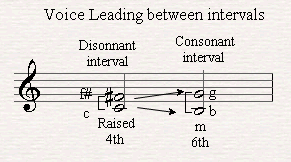 Some are described as major intervals (M) or minor ones (m). Other are perfect (P) When we raise an interval by half a tone it becomes Augmented (A) and when we lower it by a half a tone we name it Diminished (D). Way back in history in the Gregorian music the monks used to sing in two voices or more moving in perfect music intervals which are the Unisons, 4ths, 5ths and octaves. These are the perfect intervals. Later on as music developed people liked the sound of Major and Minor intervals and by doing that they slowly changed the way music sounded from a music that moves between the different intervals creating tension and releasing it between them. 2nds, 3rds, 6ths, and 7ths can be found as Major and Minor. When you play a note and then you repeat the same note you're creating a melodic intervals of a unison (also called Prima in Italian). 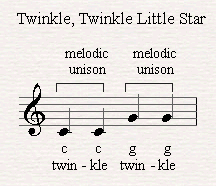 The song Twinkle, Twinkle little star begins with a melodic unison. 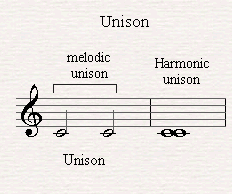 The Unison doesn't function as a harmonic music interval since there's no space between the first note and the second note. 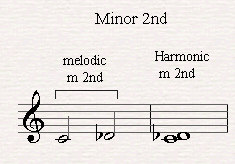 The Minor Second - When you play a note and then play the next note half a tone higher or lower (No matter if it's a white key or a black key) you play a melodic interval of a minor second. The song "stormy weather" starts with a minor second. If you play these two notes together you'll hear that the harmonic interval which is being created sounds really unpleasant and dissonant. The Major Second - When you play a note and then play the next note a tone higher or lower (No matter if it's a white key or a black key) you play a melodic interval of a major second. The song "Are You Sleeping" also known as "Frere Jacques" starts with a major second going up. The Minor Third - A distance of one and a half tones between a note and its successive follower creates a melodic interval of a minor third. Just like in the song "The Impossible Dream" or "So long, farewell" from the sound of music (going up). 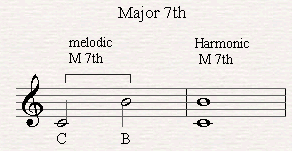 As a harmonic interval we treat this minor interval as a mellow one. It's not for nothing that we're going to base all the minor chords on this minor third interval. The Major Third -The melodic major third interval which is created by playing a note and then a successive note two tones higher is referred to as a more optimistic one. Just like in the song "When the saints go marching in" or "Halls of Montezuma". When you play a major third as a harmonic interval you'll realize it sounds quite cheerful or optimistic (I must say that reacting to sound is rather subjective yet some standards can be roughly made). Therefore later when we'll discuss the major piano chord we'll see that they're based on the harmonic major third interval. 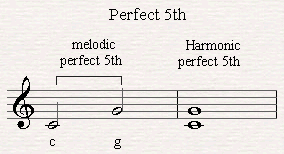 The melodic interval of a fourth is not a major and minor interval but a perfect one. Play a note and then play the next one two and a half tones higher and you'll get a fourth just like in the song: "Here comes the Bride". As I mentioned before this interval was often being sang in the Gregorian music. When my students hear the harmonic interval of a fourth they think of church bells. The melodic raised fourth is the most dissonant interval in western music. Maybe that's why the siren of an ambulance would sound a raised fourth interval in case of emergency. A melodic raised fourth (or a diminished fifth, depends on how you look at it) are created when you play a note and then the next tone 3 tones higher. Later as we discuss voice leading we'll learn when we choose to name this three tone interval as a raised fourth or a diminished fifth. It has to do with the way this dissonant interval is being solved. The song "Maria from west side story is starting with a raised fourth. This harmonic interval is called tritone (three tones) which is the most dissonant chord in western music. The melodic perfect fifth is being created when a note is played and then a successive note is being played three and a half tones higher just like the beginning of the music theme of "Star wars". The harmonic interval of a perfect fifth sound like church bells as well. Some students of mine mix the pure sound of the perfect fifth with the sound of the perfect fourth. That's logical since when you inverse a fifth down you'll get a perfect fourth. Once your ear will be able to distinguish between the two different notes of the interval you'll be able to clearly tell the difference between them. 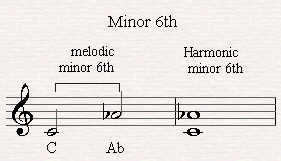 The minor sixth - - is the distance between a note and its successive note played four tones higher. This melodic interval sounds quite mellow as well as the minor third. The song "Black Orpheus" starts with a minor sixth. The Major Sixth - Do you know the beginning of the song "I did it my way"? 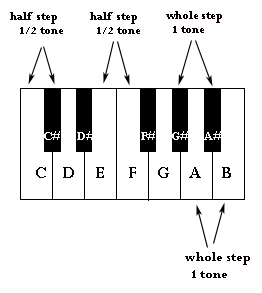 It starts with a major sixth which is created by playing a tone and then it's successive tone four and a half tones higher. The NBC theme music starts with a major sixth as well. 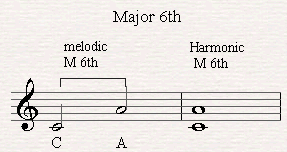 As a harmonic major interval this interval sounds rather optimistic as well as the major third. 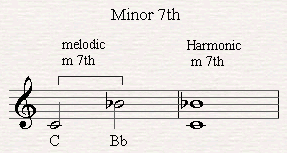 The minor seventh - is created when a note is played and then the next note is being played five tones higher. I recognize this melodic interval right away since it sounds like the beginning of the chorus of the song "The Winner Take It All" by Abba. The song Somewhere from West Side Story starts with a minor seventh as well so you could use that if you're not an Abba fan. As a harmonic interval this interval is a dissonant one we'll see how to solve the tension later. The major seventh - Sounds quite dissonant as well. It is created by playing a note and it's successive note five and a half tones higher just like in Bali Hai from South Pacific. When a melodic interval of a perfect eight is being played you play a note and the next note six tones higher. 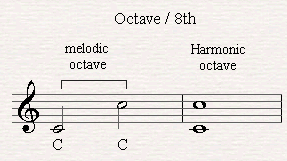 This interval is also named an "Octave". The two notes you're playing are the same only the second note is played in a higher register on the piano. The song "Somewhere over the rainbow" from the wizard of Oz starts with a melodic interval of an octave. Harmonically speaking the interval of an octave sounds rather empty since it consists of one note, only played in two registers. We're done with the first part of this music intervals lesson. Click here to go to learn more about the different music intervals and check a table which summerizes what we've learned so far.